The business enjoys exceptional goodwill and is highly regarded by local customers. Reviews on Facebook and Google all testify to the quality of meat, the welcoming and friendly environment and the exceptional level of service provided. The focus of this butchers shop is to provide top-quality fresh meat, sourced locally, and cut and seasoned on the premises. The butcher also makes a tasty selection of fresh meat products, including sausages and barbecue cuts, using a wide variety of seasonings and complementary ingredients. The butcher also has supply contracts to deliver fresh meat to local catering companies, such as cafés, B&Bs and hotels. The butchers shop is beautifully presented with a wide range of artifacts, antiques and taxidermy, all pertaining to the traditional butchers shop of a bygone era. The butchers shop features a light double-windowed space, for retail display, serving customers and where meat is cut and meat products are prepared. In the back-room there is limited fridge-freezer storage, as the meat is mostly ordered in and sold fresh, on a daily basis. The business enjoys exceptional goodwill and is highly regarded by local customers. Reviews on Facebook and Google all testify to the quality of meat, the welcoming and friendly environment and the exceptional level of service provided. Nothing is too much trouble for the butcher (the current business owner), who is renowned for his friendly approach to customers and for going out of his way to deliver quality products and services. This exceptional butchers shop enjoys high standing in the local community, and welcomes a good volume of regular customers, all year ‘round. The focus of this butchers shop is to provide top-quality fresh meat, cut from the carcass in front of the customer. The butcher also makes a tasty selection of fresh meat products, including sausages (famous locally!) and barbeque cuts, using a wide variety of seasonings and complementary ingredients. A new business owner with energy and drive would have every opportunity to greatly expand this thriving business, and further increase volume of sales. The business currently benefits from a select number of supply contracts with local businesses, including cafés and B&Bs. There is high demand for good quality locally sourced meat and food products from the Island’s service industries, presenting an ideal opportunity for this butchers shop to increase the number of supply contracts with local businesses. Currently the butchers shop only sells fresh meat and fresh meat products. However, there is opportunity to expand the products range, offering cooked meat and cooked meat products. 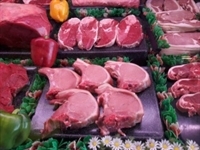 The butchers shop currently has two display units, filled with beautiful displays of fresh cut meat and meat products. Again, by expanding the range of products available, to include fresh, locally sourced fish and shell-fish, volume of sales could be significantly increased. Excellent year-round trade with seasonal peaks at Christmas, and long trading hours during the summer barbeque season. Wide selection of meats available, including wild boar, game and rabbit. Good opportunities for development, by diversifying the range of products to include cooked meats, pies, complementary cooking products and fresh fish. The butchers shop is a palace of traditional ‘butcher shop’ artifacts, antiques and taxidermy.